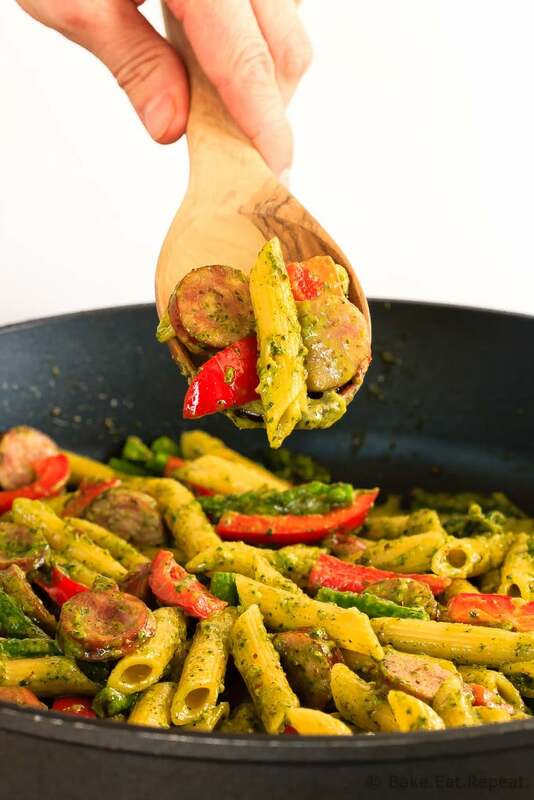 This quick and easy one pot pesto pasta with chicken sausage, asparagus and red peppers is an easy weeknight meal that the whole family will love! So that pesto pasta I mentioned on Monday that I’ve been making incessantly? This is it. 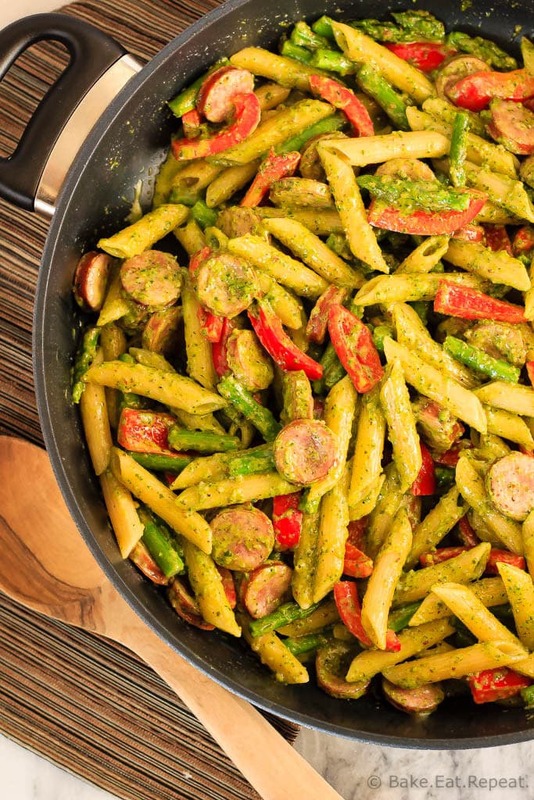 I have made this one pot sausage and asparagus pesto pasta no less then 4 times in the last three weeks. Which is a little ridiculous even for me. But it’s so easy! And the kids love it. And they’re eating a bunch of spinach with it and they still love it. Because they don’t know. It’s “green pasta” and “green pasta” it will remain because that way they eat it. If I said it was spinach pesto pasta they likely wouldn’t touch it. I’m all about the trickery when it means getting spinach into my kids without complaint. I don’t totally understand why they don’t like it. For the most part my kids are pretty good eaters, and though they may balk at trying something they haven’t seen before, they’ll usually at least taste it, and will likely eat it with no problem the next time it appears. Comes from constantly trying new recipes around here I think. They’ve learned that most of the time they’ll like whatever is on the table so it’s worth trying. But spinach? Nope, not having it. I don’t know why. Spinach pesto to the rescue – because they love this pesto pasta. So I’m milking it for all it’s worth and making it way too much. I think my husband is getting sick of seeing this one pan pasta show up on the table, but hey – you can’t have everything. 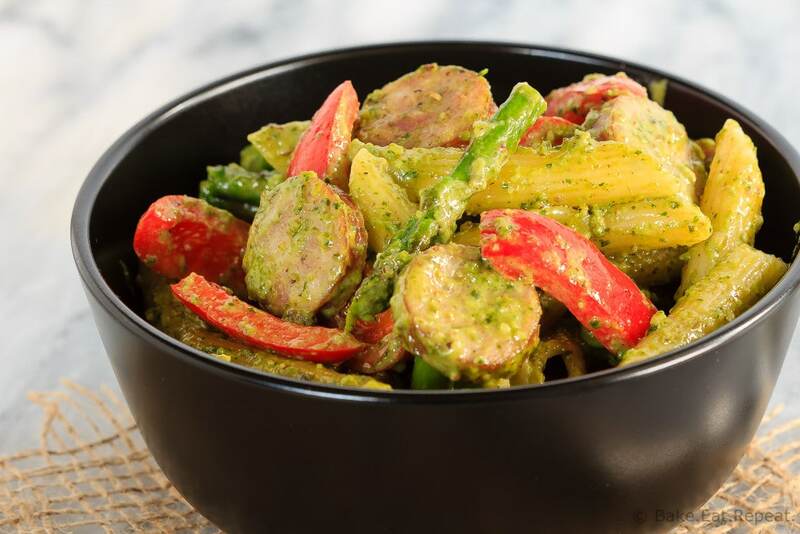 This one pot sausage and asparagus pesto pasta is fast and easy to make, and if your family is anything like mine, they’ll all love it. Even the kids. You can obviously use any pesto you like, but I like using this homemade spinach pesto in this recipe. Plus, since it’s the first Thursday of the month, I also have a whole list of other quick and easy meals for you from my blogging friends! You can also find other 30 Minute Thursday posts here for lots more 30 minute meals to get you through those busy nights! I use this big pot to make this meal and love it – super non-stick and easy to clean and it’s a perfect size with a lid – no affiliation with the company, just love this pot if you’re in the market for one! In a large, stovetop pot over medium heat, cook the smoked chicken sausage, stirring it a few times, for 3-4 minutes or until it’s lightly browned. Add the chicken broth, heavy cream and dry pasta and stir to combine, making sure the pasta is covered by the liquid (as much as possible). Put a lid on the pot and let it cook, stirring once or twice for 8-10 minutes, or until the pasta is tender. Add the asparagus and red pepper, return the lid and cook for 1-2 minutes more until the vegetables are tender crisp. Stir in the pesto and parmesan cheese and serve. Note: The type of pasta you’re using may make a difference in how much liquid you need. I used white pasta that takes 8-10 minutes to cook to al dente according to the package. If the pasta you’re using takes longer then that to cook you might need to add a bit more liquid. If the liquid is all absorbed and your pasta is not yet tender just add a bit more chicken broth and keep cooking until it is tender. This is the perfect simple and veggie packed meal for busy weeknights. I love spinach pesto and pasta is always a hit with the kiddos here! I've never tried spinach pesto before, but now I NEED to! This is my kind of one pot meal, Stacey! I love the asparagus in here, too. Sounds perfect! I love all versions of pesto. It's so fun to play with different greens, like spinach. Gotta think beyond the basil! This pasta looks fantastic! Love how easy it is! I started using spinach in my pesto sauce years ago when I had a whole bunch on my hands and I loved it so much that I make it all the time! It's such a great way to get your kids to eat spinach and this meal is something that we would love. I'm going to put it on the meal plan!